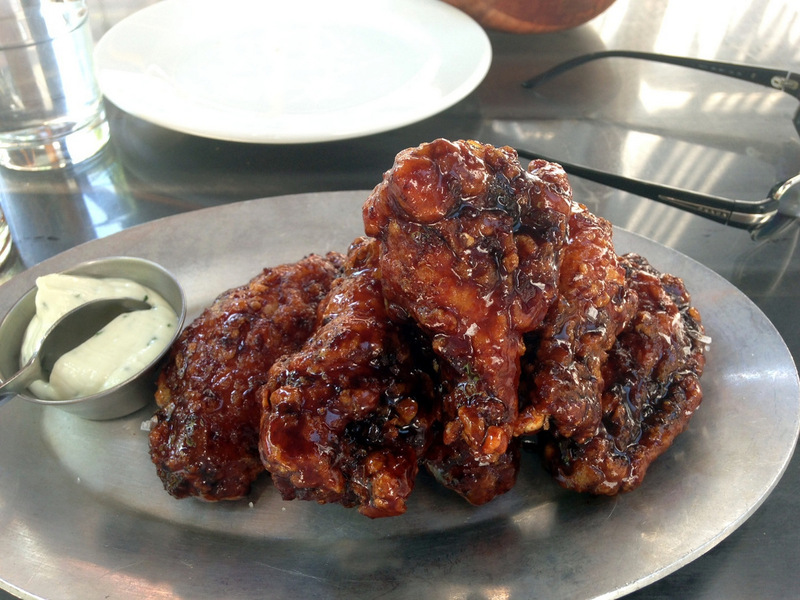 In my constant pursuit of great chicken wings as of late (another middle age crisis symptom), I targeted two year old Distilled in Tribeca. Distilled originally opened as an interesting looking destination spot from a Momofuku Noodle veteran, and settled down into more of a popular neighborhood gastropub with a talented team of mixologists (partly judging by the exceptional Bloody this morning). But the one constant since the beginning seem to be the glorious wings. They are double fried to crispy perfection, and coated with a thick and messy layer of Gochujang (that fermented Korean sauce you put on your Bibimbap). They serve it with their own version of not too funky blue cheese sauce to cool things down. Really excellent hefty, top quality wings. My next destination is a slice of Pizza. Yes, I biked all the way here from Tribeca for a slice. But lets go back for a sec. 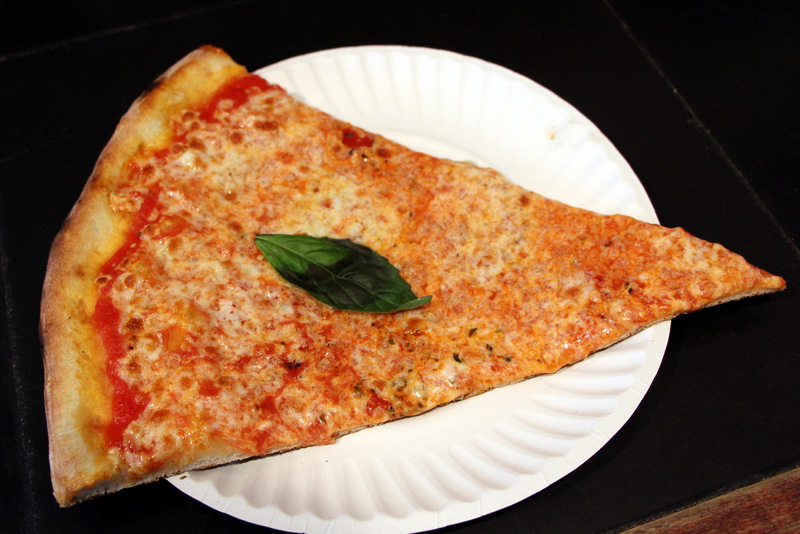 About a year ago, when I had one of those cherished free days, I decided to drive around Brooklyn for various iconic slices I haven’t had in a while and more. I had the great L&B Spumoni, the legendary Di Fara (after a 45 minute wait), and then drove to Williamsburg for Best Pizza which proved to be Best of the bunch especially while factoring in some of the pain involved getting some of the others. The funny part is that Roman based food writer Katie Parla did something similar a month later, and also proclaimed Best Pizza as the winner. Now, back for yet another NY style slice (need to save room for the next most highly anticipated stop) from the wood burning oven, with that signature basil leaf in the middle for added aroma. Great slice again with an unusually well balanced cheese/sauce proportions. Owner Frank has an extensive pizza resume, along with a stint at the Culinary Institute of America. 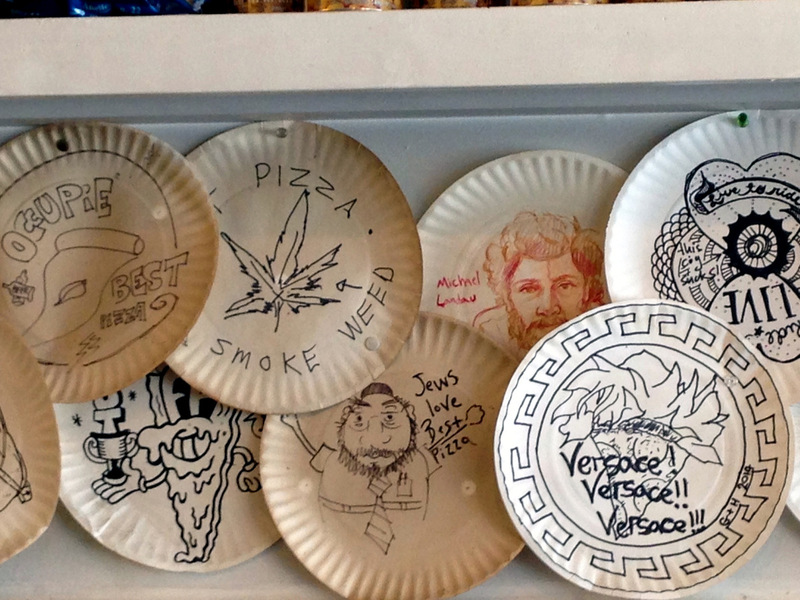 The paper plate art alone including the “Jews love Best Pizza” plate is worthy of a schlep. 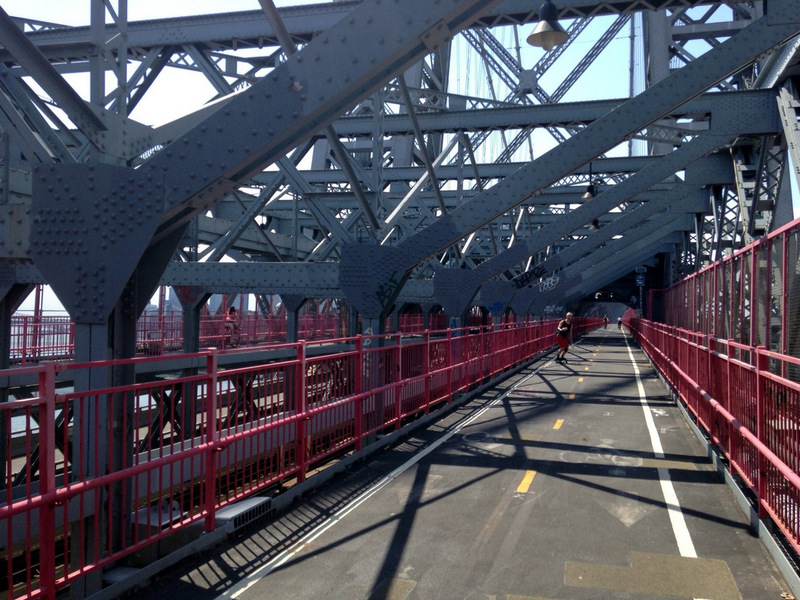 Back on the bike, and back to the “city” via the much quieter Williamsburg Bridge. The emptiness means more freedom to move around so you can fly like a bold eagle! Until you realize you are on a Citibike, and you are dangerously close to being passed by an 80 year old woman (that actually happens often to me in Italy). Its hard to look cool on those little blue bikes, especially in Central Park. The only chance you have is to ride in the rain (not drizzle, rain), or with just one hand. Until you face another blue frontal balding biker riding with one hand and you realize it doesn’t look as cool as you thought. Anyway, sometimes the most anticipated items prove less than thrilling at the end (see Best vs Di Fara). Such is the case with Fuku, the hottest sandwich in town at the moment from David Chang’s Momofuku empire (As some of you know, I’m a fan). Perhaps I got Fukued. My 30 minute wait was about half outside, half in after paying for it. “Credit Only for now” is something I haven’t heard anywhere yet I don’t think. After paying, you get a number with a stick, and you can stand with your number just about anywhere looking like a dork, for the order girl to eventually find you. Sort of like one of those bachelorette games…”bachelor #23 if you were a kitchen appliance, what appliance would you be”… Eventually the “spicy fried chicken” arrives. Its a flat almost schnitzel like, thigh meat sandwiched by a tiny potato roll that is meant to serve as a handle. Not the sexiest looking thing. There are also sliced pickles in there somewhere that serve almost no purpose. The first few bites were interesting, featuring decent flavor, then the struggle took over. Stringy, uneven texture throughout, with crust and meat not so happily married. 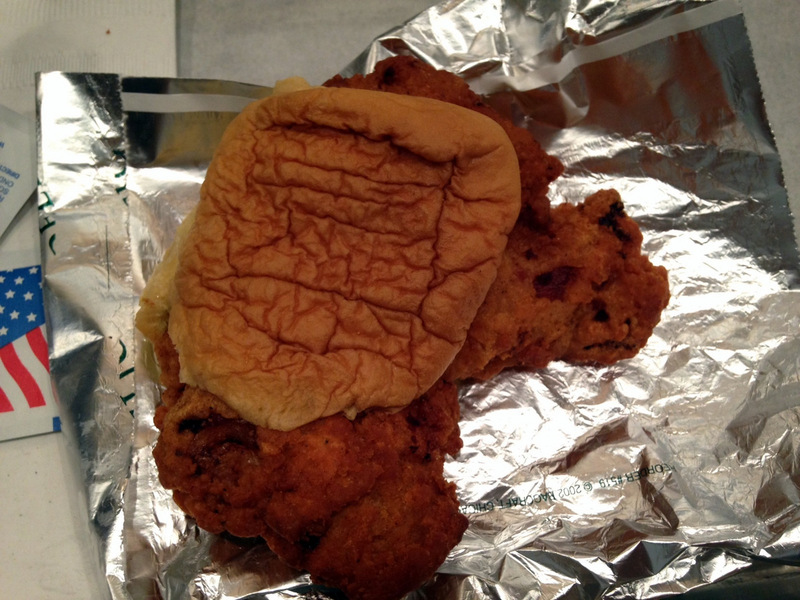 Not very spicy for a sandwich called Spicy Chicken. It wasn’t a total mess, but far from that hot, much anticipated item I was so looking forward to. Try for yourself! 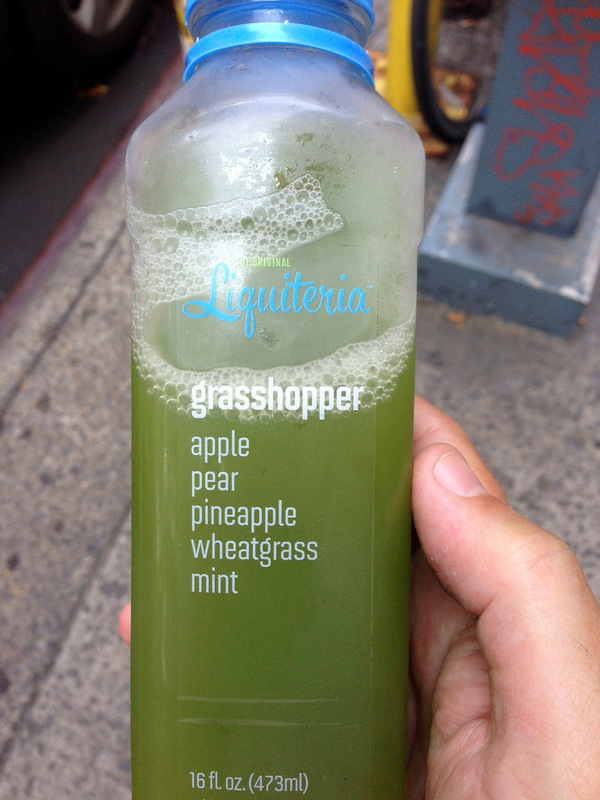 A Battle of the Bridges is incomplete without my favorite thirst quencher which happens to be nearby, the Grasshopper from Liquiteria. Its not cheap at around $9, but so refreshing on a hot day. 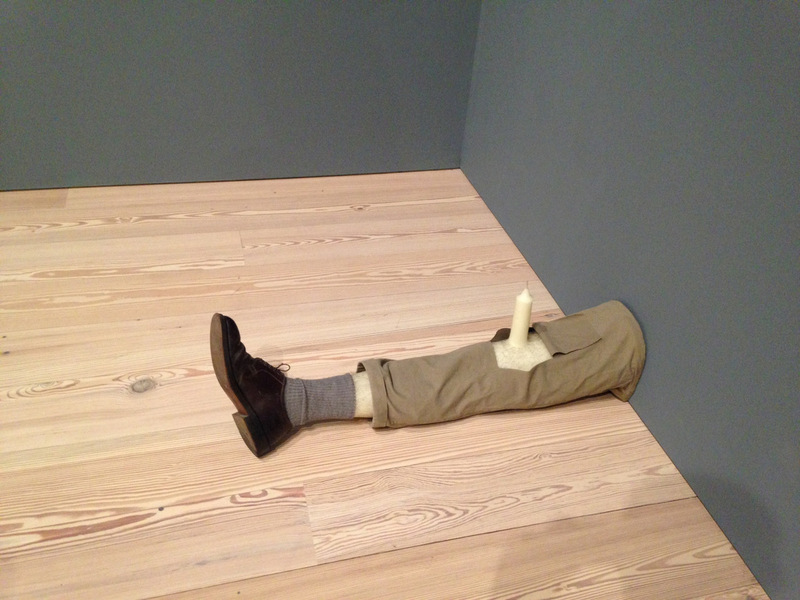 I proceeded then west, cruising 13th st, passing Da Andrea, All’Onda and eventually Santina on the way to meet Hummus Whisperer and baby Hummus Whisperer at the new Whitney Museum by the Highline. 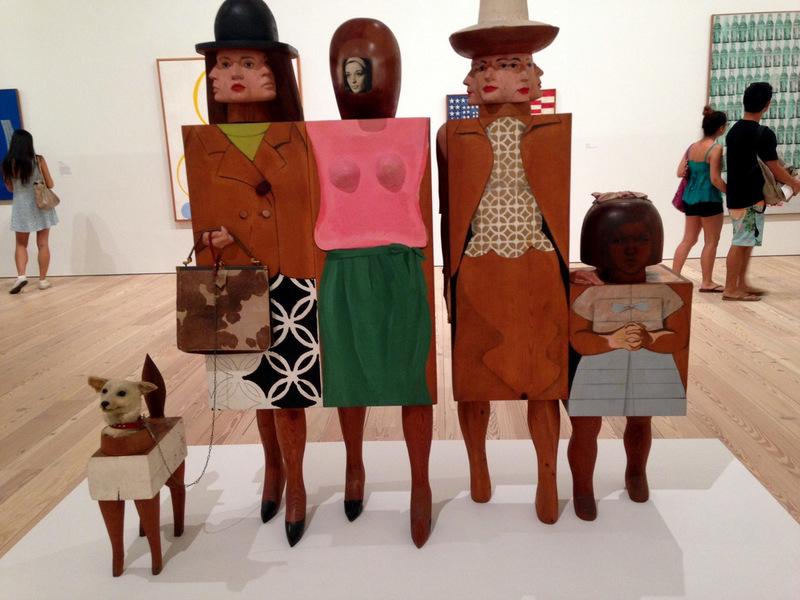 There I rediscovered the joys of quirky American art, and the joys of watching quirky American art while holding hands of a baby surrounded by the striking Manhattan upper class. Its a a scientific theory that’s proven time and time again; Babies, preferably cute ones, are babe magnets! The museum is actually very cool. 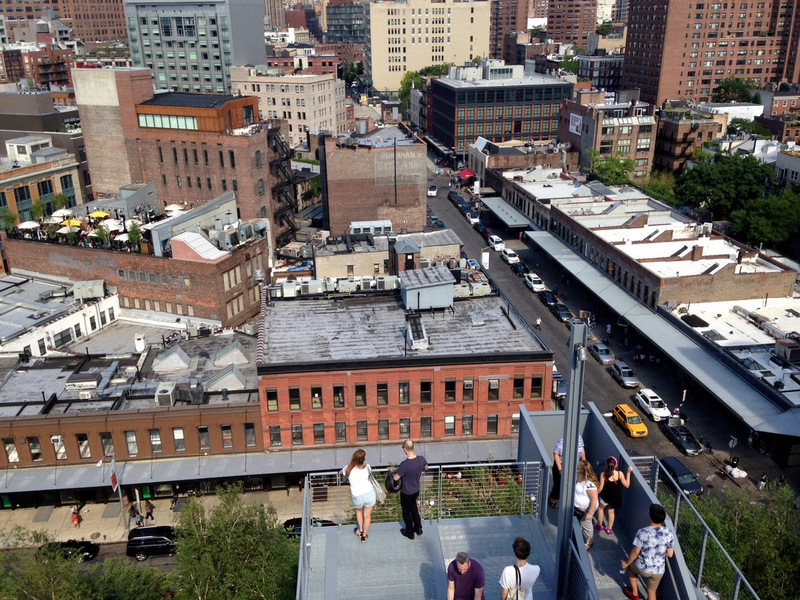 You can couple it with the Highline, and dinner/lunch at Untitled (thats the name) inside the museum, or Santina a few steps away. I said goodbye to HW and baby for hire and headed uptown via Hudson River Park, perhaps our most important and one of the most scenic bike paths. Between the rotating art in the 50’s and 60’s, various parks (another good place to bring your neighbor’s babies! ), piers, people watching, and stops along the the way like Chelsea Market, Gotham West, I can easily spend a whole day here. 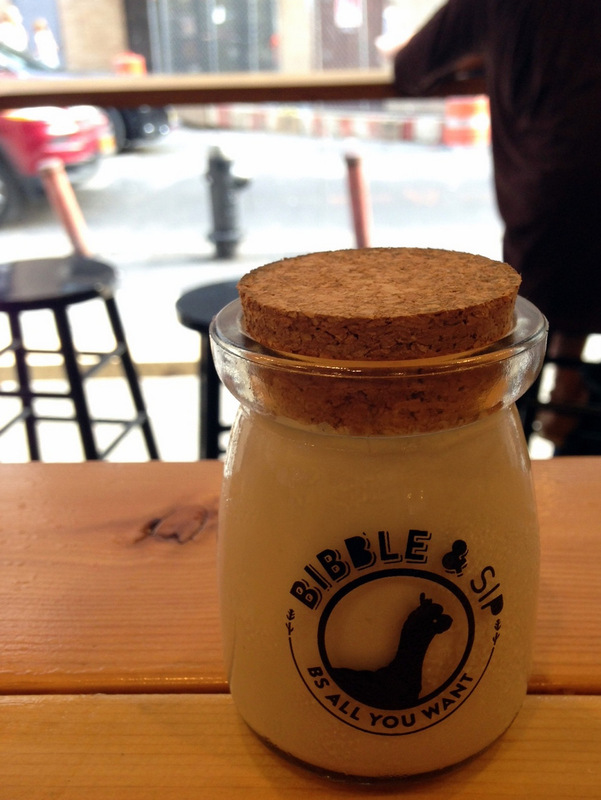 My last stop was at one of the newest Hell’s Kitchen bakeries, Bibble & Sip. Well technically just outside Hell’s Kitchen but got all the making of another unique Hell’s Kitchen bakery. Nice place to sit, relax and BS all you want! The Earl Grey Banana Bread is quickly gaining neighborhood fame. Add the Matcha Cream puffs, various scones, the occasional English Muffins sliders and all sorts of rotating goodies. I visited it three times before, and on this day the Earl Grey Panna Cotta proved to be the perfect finisher to a fun day.